If you anticipate hauling a lot of people and stuff, opt for the longer GMC Yukon XL, though remember to measure your garage first! The 2019 GMC Yukon pairs an old-school SUV mentality and capability with some new-age tricks, enough to keep it from feeling like a relic. For 2019, GMC keeps the Yukon fresh by adding a budget-conscious Standard Edition Value Package as well as a Graphite Edition and Graphite Performance Edition packages to the SLT trim. Other trims include the base SLE and the near-luxury Denali, which pushes the Yukon into the territory of its platform mate, the Cadillac Escalade. The Chevrolet Tahoe rounds out the trio of GM truck-based SUVs and can be had in long wheelbase Suburban form as well, usually at a slight discount over the GMC. There are also three new metallic colors available for 2019: Dark Sky, Pepperdust, and Smokey Quartz. The Yukon is offered with a choice of V-8 engines, either in 5.3-liter, 355-horsepower guise or the mighty 6.2-liter which makes 420 hp. It can also be had with either rear- or four-wheel drive and pushes the power to the wheels through a 6-speed automatic with the 5.3-liter V-8 or 10-speed automatic with the 6.2. Thanks to the beefy ladder frame and solid rear axle, the Yukon can tow an impressive 8,500 pounds. The 5.3-liter V-8 is the thriftier of the two engines and returns surprisingly good fuel economy thanks to cylinder deactivation technology at higher cruising speeds. Inside, the Yukon’s car-like dashboard and high-quality construction make for a pleasant experience, but you should expect nothing less at a base price of nearly $50,000. 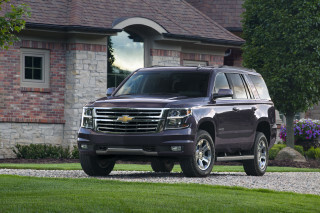 The Yukon, along with its Chevrolet sibling, is the last full-size SUV to offer a bench seat up front, but only on economically-minded models. Otherwise, two bucket seats adorn the front cabin, and passenger space gets significantly smaller as you move back in the three rows of seating. The longer Yukon XL more comfortably accommodates passengers and stuff but is a massive vehicle on the road. The third row folds flat, and with the second row upright, the Yukon swallows several suitcases and more, especially in XL guise. With the third row in place, however, the Yukon manages precious little cargo space, so opt for the XL if you plan to carry more than five people and all their stuff on a regular basis. All Yukons suffer from a high load floor, which can make loading heavy or unwieldy items a pain. Most Yukons come equipped with a handful of safety features as standard, including anti-lock brakes, stability control, and bucket seats with a front-center airbag designed to prevent the driver and passenger from colliding in a wreck. 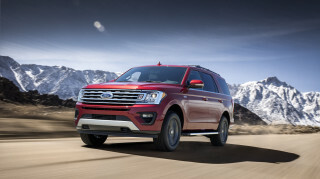 SLT and Denali models have adaptive cruise control and automatic emergency braking as an option, as well as blind-spot monitors, lane-departure warnings, and front parking sensors. Thankfully, all Yukons feature an excellent 8.0-inch touchscreen infotainment system with Apple CarPlay and Android Auto as standard, though a baked-in navigation system can be had for extra, as well as a monthly subscription for GM’s excellent 4G LTE in-car Wi-Fi. The 2019 GMC Yukon sports elegant looks inside and out to match its hefty price tag. SLE and SLT Yukons are nearly indistinguishable apart from their wheel designs on the options list. While it’s certainly not ashamed of being boxy, a few curves throughout give the Yukon a more elegant look than its Chevy Tahoe twin, thanks to swept-back headlights and a big, prominent grille. In the back, the Yukon is almost indistinguishable from the Tahoe, with a big boxy tailgate flanked by rectangular taillights. The Yukon Denali adds a heaping helping of chrome to the exterior, which can verge on gaudy with massive 22-inch chrome wheels fitted too, but clearly it works for them, as GMC reports that almost three quarters of Yukons sold are Denalis. Inside, the Yukon’s curvy, symmetrical dash is a nice change of pace, with a high and prominent 8.0-inch touchscreen acting as the cornerstone. The look is a bit outsized for most SUVs, but that matches the truck-like demeanor of this old-school ride. Opting for a Denali model adds a significant amount of kit, including faux wood accents and different shades of leather with stitched surfaces. The 2019 GMC Yukon's two V-8 options provide it with massive towing ability and strong acceleration. Most Yukons come equipped with the respectable 5.3-liter V-8, which makes 355 horsepower and 383 pound-feet of torque through a 6-speed automatic transmission and rear- or four-wheel drive. This engine has a refined, muffled demeanor, but those looking for a bit more oomph should opt for the alternate 6.2-liter V-8, which cranks out 420 hp and 460 pound-feet through a 10-speed automatic. 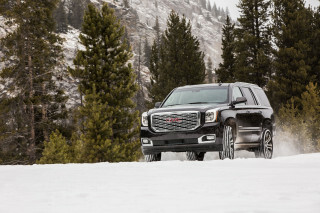 The big engine is standard on the Denali trim and available on the new SLT Graphite Performance Edition package. Both engines can save a bit of fuel by running in four-cylinder mode at higher cruising speeds, with only a slight change in the sound and a small “V4” indicator on the gauge cluster to let you know that it’s working. Thanks to big V-8 power, the Yukon handles daily driving and towing situations with aplomb, with the highest tow capacity a Yukon can manage standing firmly at 8,500 pounds. This maximum is achieved, interestingly, with the rear-wheel drive standard wheelbase model. Without a full battalion of passengers and stuff on board, the Yukon Denali tips the scale at about 5,500 pounds, and is remarkably fast for a vehicle that size, though you’ll start to notice its heft in the corners pretty quickly. Keeping this in mind, the Yukon actually manages some pretty deft steering and not too much body roll. The smaller wheels on SLE and SLT trims make for a more comfortable ride, but the Denali compensates for its larger rims by adding magnetic shocks, which helps filter out road imperfections and improve handling. Given its heft, the Yukon isn’t much of an off-roader, but those who find themselves beyond the pavement should fare well enough, thanks to the optional four-wheel drive system with low-range capability and optional skid plates. The 2019 GMC Yukon offers tremendous passenger- and cargo-hauling abilities, especially in Yukon XL form. Thanks to excellent build quality and decent comfort, the 2019 GMC Yukon has a high-end feel with lots of cargo space. In every Yukon outside of the base SLE, you’ll find twin bucket seats up front with a wide center console. Cloth is standard, but almost every Yukon sports leather upholstery, as it’s standard on SLT and Denali trims in several available shades. 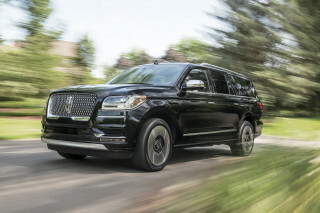 The second row is comfortable enough for most adults either in bench or captain’s chair forms, but rear seat passengers will find things pretty tight unless riding in the much longer Yukon XL. With the second and third rows folded flat, the Yukon manages 95 cubic feet for space, while the XL model rings in at a whopping 121 cubic feet. Both versions of the Yukon offer many cupholders, storage cubbies, and more to store smaller items. Even at its base, the Yukon is adorned with ample soft-touch materials and stitched surfaces that give it a quality feel, and things get even better on the SLT and Denali models. However, as it pushes into the $80,000-plus range, this quality isn’t quite enough to match the price tag of the highest-spec Denali. At that price, it may be time to consider a Cadillac Escalade. The 2019 GMC Yukon offers a wide variety of safety tech on higher trims but hasn’t been fully scored for crash tests yet. 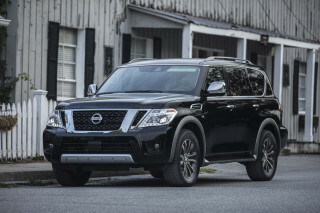 All Yukon models come standard with airbags, stability control, traction control, and anti-lock brakes, as well as a nifty center-mounted airbag designed to protect front seat occupants from colliding with each other during a crash. 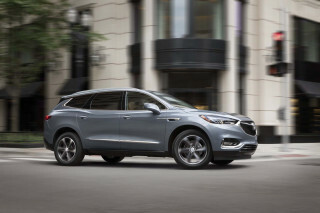 Low-speed automatic emergency braking is optional on SLE and standard on SLT and Denali, and the full-speed version comes optional on SLT and Denali models along with adaptive cruise control. If you want active lane control, automatic high-beam headlights, and power-adjustable pedals, save up your cash for an SLT or Denali. The NHTSA gives the Yukon four stars overall with five stars in front and side impact tests, though the overall score is soured by its three-star rollover rating. 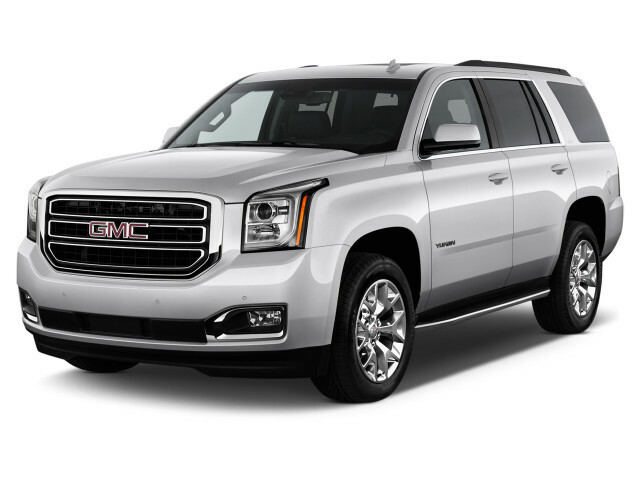 Although top-tier versions carry high price tags, the 2019 GMC Yukon is well-equipped in almost any guise. The Yukon and XL are identical in terms of standard features for trim levels, making ordering easy. Starting with the base SLE trim, you’ll get cloth upholstery, a front bench or two buckets with a big center console. Three rows of seats are standard, as well as 18-inch wheels, an 8.0-inch touchscreen infotainment system with Apple CarPlay and Android Auto, Bose audio, automatic wipers, and automatic three-zone climate control. Optional extras include a baked-in navigation system, power liftgate, and the Enhanced Driver Alert package that includes automatic emergency braking, forward collision warnings, active lane control, and automatic high beams. Once you’ve loaded up an SLE with all these options, though, an SLT isn’t much pricier and offers more features. Choosing the SLT trim adds leather, heated front and second-row seats, ventilated front seats, a heated steering wheel, keyless ignition, and power-folding second and third rows. The only options are full-speed automatic emergency braking, a rear-seat entertainment system, navigation, and a moonroof. At the top of the lineup, the Yukon Denali adds an upgraded Bose audio system with active noise canceling, 20-inch awheels, and magnetic suspension. Some options on the Denali include power side steps, 22-inch wheels, adaptive cruise control, and a moonroof. If you’re buying a 2019 GMC Yukon, you’re probably not in it for the fuel economy, but this truck is thriftier than you might expect. Rear-wheel drive Yukons are thriftier than their siblings, with 16 mpg in the city, 23 on the highway, and 19 combined from the 5.3-liter V-8 and 6-speed automatic transmission. Opting for an extra two driven wheels brings those numbers down to 16/22/18 mpg. With the big 6.2-liter V-8 and 10-speed automatic equipped, the overall fuel economy is 14/23/17 with rear-wheel drive regardless of whether you pick the standard Yukon or the long wheelbase, and adding four-wheel drive drops the numbers to 14/22/17 for the short wheelbase and 14/21/16 for the Yukon XL Denali. Fuel economy is helped slightly on the highway thanks to the cylinder deactivation system, which shuts down four of the cylinders at low cruising speeds to bump up mileage.